One great reward life offers some people is the chance to make their living doing something they loved as a kid. When I was young, I loved my bike. Riding it, of course, but monkeying with it too-getting my hands dirty swapping seats or handlebars, attaching a mirror or basket, even repairing an inner tube. I loved going to stores to check out bike parts. But then derailleurs came and outsmarted me. Erik Dean used to do something similar when he was a kid, but he did something about it. Erik grew up locally and, after graduating from NSU, worked in insurance in Aberdeen, North Dakota, and Nebraska before coming back home. In 2011, tired of corporate life, he walked into Dakota Outdoors, the store he liked to visit as a kid, and asked Chuck Prochaska and Mark Grasse if they wanted to sell the store they had owned since 1978. They said yes. When I was young, there used to be, like, three styles of bikes: kids bikes, adult bikes, and cool bikes-stingrays with banana seats, chopper handlebars, and sissy bars (I wish I had kept mine after I saw one on eBay for $5,000). Now there are many categories of bikes, and Erik sells about a dozen. Styles range from easy-ride comfort bikes and cruisers, to mountain bikes made for rugged terrain, and road bikes-the one-time 10-speed bikes that now have 20 to 30 speeds and are made for pavement. There are a variety of styles in between, as well as hybrids that combine elements of different styles. 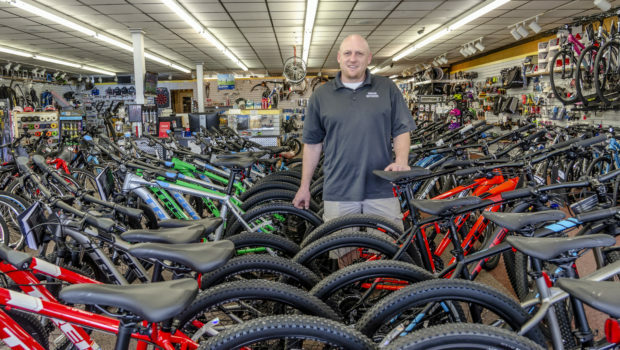 Erik says he sells a wider variety of bikes than the old store, both more models and brands. 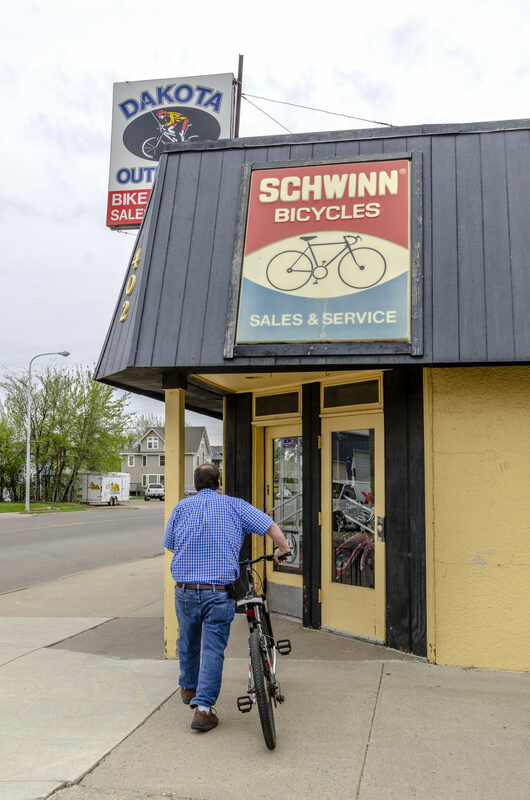 “I didn’t know a lot about bikes when I bought the store,” he admits, “but I learned.” Now when someone tells him how they want to use a bike, he can point them to the right style. 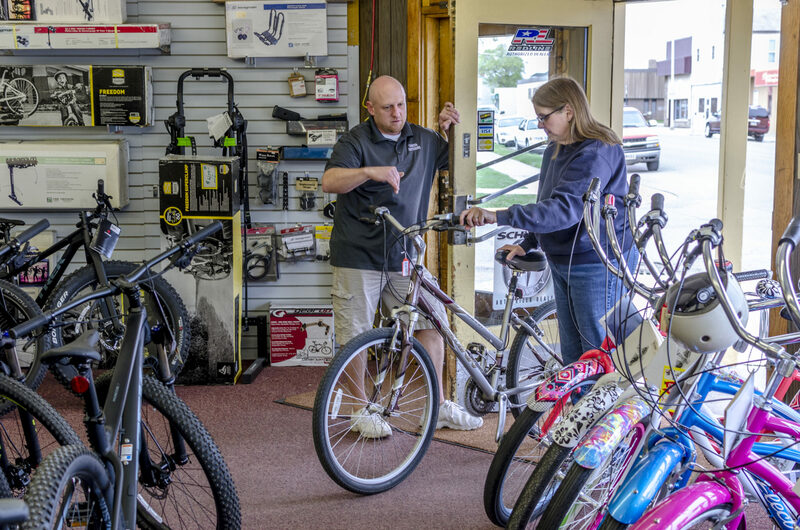 Service is a key part of Dakota Outdoors. They service what they sell and whatever people bring in. It’s kind of in Erik’s blood. 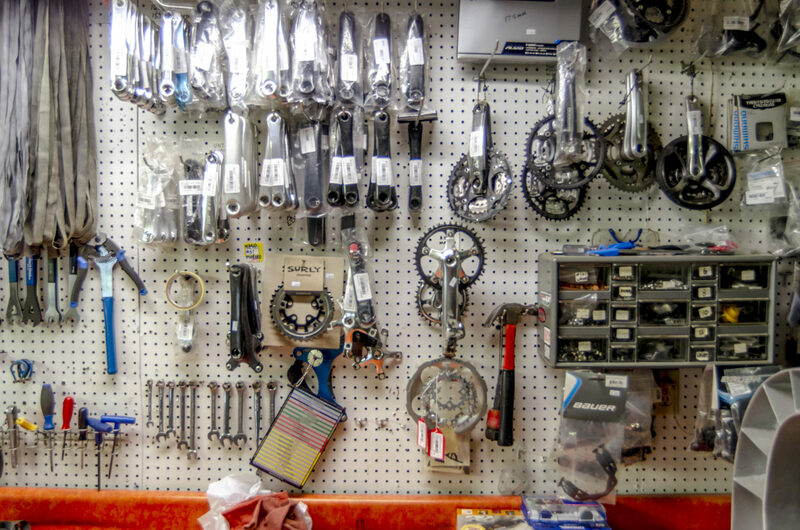 “I did fix, or attempt to repair, my own bicycles as a kid,” he says. “I repair bikes now for two reasons: I enjoy working on bikes, and I do learn about the products more in depth by assembling and repairing the bikes.” He also employs his teenage sons part time in bike repair (their daughter does janitorial work). 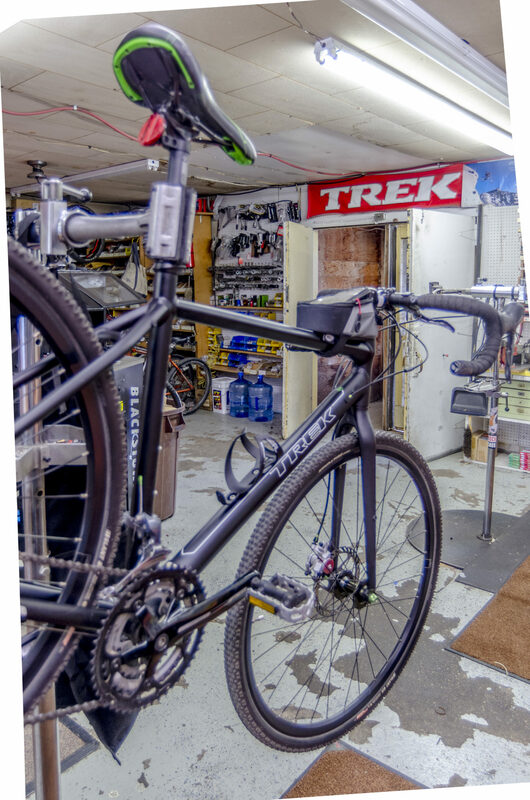 Following on his motivation for doing repairs, “It’s really important to keep educated,” Erik points out, “to be on top of what we’re selling and what the industry is doing.” When he and Bridget travel, they often check out other bike stores and talk to the owners to learn from them. “We can share information with other stores,” he notes. “There’s no need to reinvent the wheel” [author’s note: bike humor]. 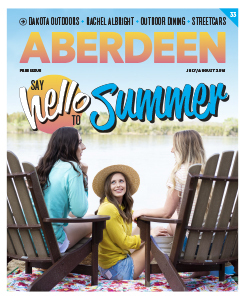 It must be a bike store thing: Aberdeen expatriates who manage bike shops elsewhere also come to Dakota Outdoors and talk shop. Bikes are still the biggest part of the business, and fitness equipment is the second major product line. On many days, I ride an exercise bike at home (I have to after my kids hauled it up from the basement and eliminated an excuse). When I stop at Dakota Outdoors, I can be tempted by the recumbent bikes, the chaise lounge of fitness, but I’m afraid of falling asleep. Erik expanded the fitness line and moved to higher-end gear. It’s not exactly “Outdoors” equipment, but it does seem to have a season. I think it’s called New Year’s resolution season in the industry (i.e., when I bought my exercise bike). 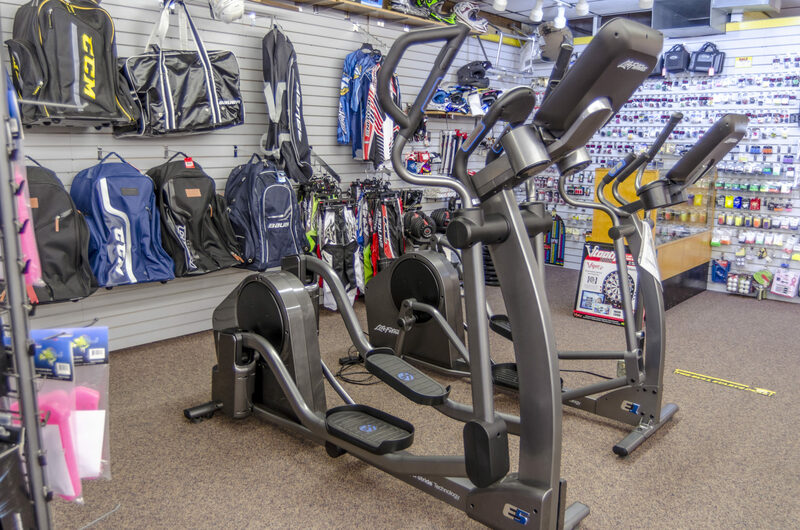 From fall to late winter, treadmills and other equipment are front and center in the store, then they move to the back to make room for bikes, a sign of spring. Erik’s crew will deliver and set up your equipment, remove your old gear, dispose of it responsibly, and service it (they also have contracts to service fitness equipment at many local schools and organizations). 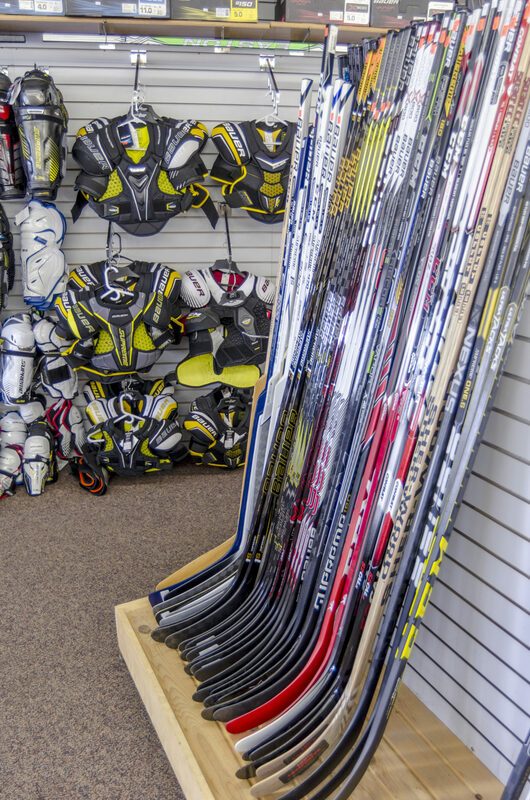 Dakota Outdoors also stocks hockey gear, a very specialized line in Aberdeen with a pretty defined market. 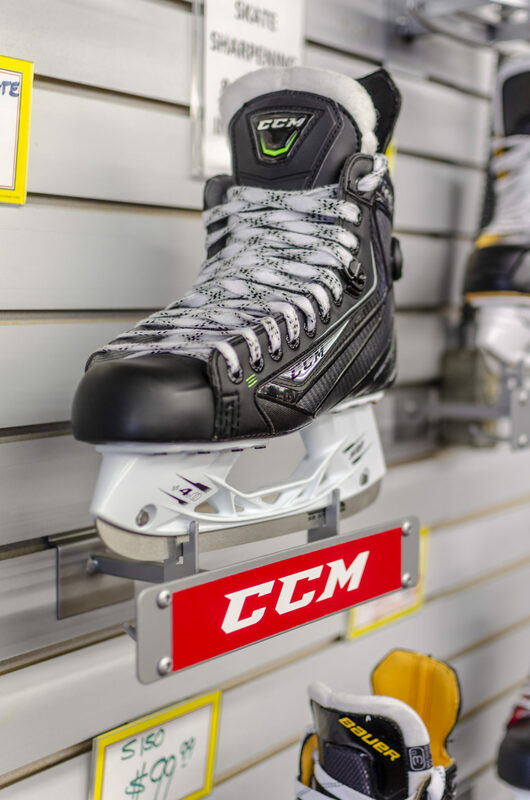 As the designated supplier, Erik works with the Hockey Association, which dictates the products, to learn the number of kids playing each year, which dictates quantity. “It’s not a complicated business,” he laughs. A strange fit, darts were in the store when Erik took over. “People were used to coming here to buy darts, so we kept them,” he shrugs, “They don’t take up much space.” Marketing darts is basically word-of-mouth both among players and between them and the store. “We learn from dart players what to buy,” he says. One of the primary areas of learning has been in inventory and stocking. “That’s been a lot of trial and error,” he admits. “You make mistakes and learn.” He’s definitely learned to listen to customers. “High end bikers know the products well,” he says. “Sometimes they race elsewhere and bring back information on trends.” On the topic of racing, Dakota Outdoors sponsors some local bikers, including Craig Harrison, a world-class competitor. 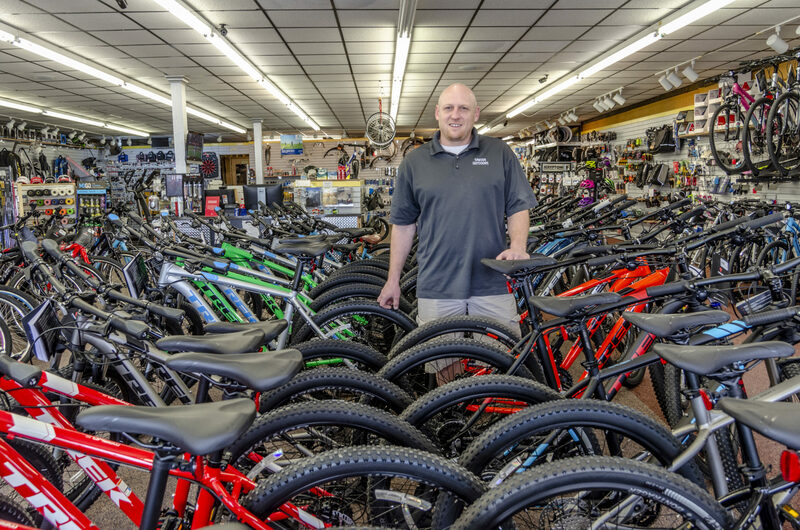 Erik Dean, owner of Dakota Outdoors, has learned everything there is to know about finding the right bicycle for his customers.